Dale Toth is your country master. 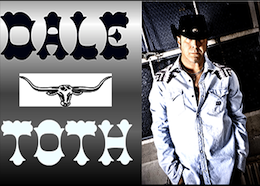 If you like to stomp your foot to the timeless country tunes, line dancing songs or even the today’s modern Luke Bryan country jams then you will enjoy Dale’s performance. Also very flexible in various genres he also can take requests and play your favorites at any given time. The main man and founder of the band BIG HIX he delivers a one man show yet the energy and enthusiasm of his bands influence.